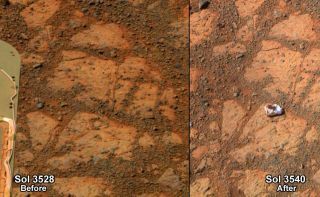 This before-and-after pair of images of the same patch of ground in front of NASA's Mars Rover Opportunity 13 days apart documents the arrival of a strange, bright rock at the scene. The rock, called "Pinnacle Island," is seen in the right image on Jan. 8, 2014. The image at left was taken on Dec. 26, 2013. As if NASA didn't have enough to worry about, the U.S. space agency is now faced with the scandal of the century — they’re being sued for not investigating a bona fide life form on Mars! Except, it isn't. In fact, it’s quite funny. Remember when news broke about the mystery Mars rock that mysteriously appeared in front of Mars rover Opportunity? Well, according to petitioner Rhawn Joseph, the official explanation for said “mystery” rock — that scientists have dubbed "Pinnacle Island" — is a complete sham. Why? Well, through flawless reasoning skills, Joseph thinks that this is in fact proof of alien life on Mars and NASA is unwilling to investigate any further. For an agency that is currently looking for habitats comfy for life as we know it, it sounds grossly negligent that one of their rovers should see a Martian Spongebob Squarepants pop up in front of its camera only for it to be fluffed over as "just a rock." "… compel and order the National Aeronautics and Space Administration (NASA) and its Chief Administrator Charles Bolden, to perform a public, scientific, and statutory duty which is to closely photograph and thoroughly scientifically examine and investigate a putative biological organism which was identified (and thus discovered) by Petitioner, and photographed on Mars by NASA's Mars' rover Opportunity in January 2014, and which NASA referred to in a press release as: 'unlike anything we have seen before … We are totally confused.'" Indeed, at the "10 Years On Mars" meeting at Caltech, Pasadena, Calif., earlier this month, lead scientist of NASA’s Mars Exploration Rover Opportunity Steve Squyres did say the origin of the object in question was a mystery and that it had his team baffled as to where it came from. There was never any doubt that was still just a rock. Raw images of the rock and preliminary analyses were discussed and potential sources for the rock were highlighted. The leading theories are, 1) the rock is in fact impact ejecta from a nearby meteorite fall or, b) the rock was flipped out of place by the rover as it turned on the spot. Lacking corroborating evidence, Squyres indicated that the latter explanation was the most likely. Steve Squyres, lead scientist for NASA's Mars rover Opportunity, points at a strange rock found by the rover on Jan. 8, 2014, where earlier there had been nothing, during a Jan. 16 presentation. The rock has been named "Pinnacle Island." And now, after further analysis of images taken by Opportunity, there’s a divot just beneath the rover that may well be the source of the flipped rock. No way! says Joseph. Sadly, it seems he hasn't heard about Occam's Razor — among competing hypotheses, the hypothesis with the fewest assumptions should be selected (in this case, the Mars aliens hypothesis requires a whole boatload of assumptions) — a fact that is troubling considering Joseph says he’s an astrobiologist with a long string of papers published in "leading journals." But he’s also affiliated with the questionable Journal of Cosmology that has a habit of publishing below-par research on alleged aliens in meteorites and aliens floating in the upper atmosphere, so that may explain a few things. As he’s already burnt a few bridges as to his scientific reasoning skills, Joseph decides to go personal, saying, "(a)ny intelligent adult, adolescent, child, chimpanzee, monkey, dog, or rodent with even a modicum of curiosity, would approach, investigate and closely examine a bowl-shaped structure which appears just a few feet in front of them when 12 days earlier they hadn’t noticed it. But not NASA and its rover team who have refused to take even a single close-up photo." Joseph obviously doesn't use the internet as Opportunity has returned many close-up photos of the Mars rock that, by the way, was already being treated as an immensely valuable science target. As the writ has no foundation, especially as Opportunity has already done some pretty thorough analysis of the rock using its suite of cameras and microscopic imager, this is just an attention-seeking effort that highlights the day-to-day frustrations scientists face when confronted with individuals with overactive imaginations. The real search for extraterrestrial life is far more interesting and a little more scientific than thinking you can see a fungus growing from the Martian surface.